The number of fire fighters struck and killed by motor vehicles has dramatically increased within recent years. During the 5-year period between 1995 and 1999, 17 fire fighters were struck and killed by motorists. This represents an 89% increase in the number of line-of-duty deaths over the previous 5-year period (between 1990 and 1994), when 9 fire fighters were struck and killed by motor vehicles [NFPA 2000]. Under the Fire Fighter Fatality Investigation and Prevention Program, NIOSH investigated two separate incidents involving fire fighters who were struck and killed while providing emergency services along roadways during 1999 [NIOSH 1999, 2000]. These incidents and data demonstrate that hazards to the fire service are not limited to structural or wild land fires. Motorists accustomed to a clear, unobstructed roadway may not recognize and avoid closed lanes or emergency workers on or near the roadway. In some cases, conditions can reduce a motorist?s ability to see and avoid fire fighters and apparatus. Some examples include weather, time of day, scene lighting (i.e., area lighting and optical warning devices), traffic speed and volume, and road configuration (i.e., hills, curves, and other obstructions that limit visibility). These hazards are not limited to the fire service alone. Other emergency service providers such as law enforcement officers, paramedics, and vehicle recovery personnel are also exposed to these hazards. On August 5, 1999, one fire fighter died, and a second fire fighter and another person were severely injured when they were struck by a motor vehicle that lost control on a wet and busy interstate highway [NIOSH 1999]. A heavy-rescue squad and a ladder truck had been dispatched to a single motor vehicle crash on an interstate highway. Approximately 2 minutes after they arrived on the scene and took a position to the rear of the rescue squad (protecting the initial vehicle crash scene), another car collided with the back of the ladder truck (Figure 1). While attending to the injuries of the driver who struck the ladder truck, two fire fighters and the injured driver were struck by a third car, causing one fire fighter to be fatally injured and the second fire fighter and the driver (who had collided with the back of the ladder truck) to be severely injured. On September 27, 1999, a fire fighter died after being struck by a tractor trailer truck while directing traffic along a four-lane highway [NIOSH 2000]. The victim was standing in front of an apparatus that was parked (facing north) in the outer emergency lane for the southbound traffic. The emergency lights of the apparatus were on and functioning properly at the time of the incident. He was called out to provide assistance for a neighboring fire department that had responded to a tractor-trailer crash. The initial tractor-trailer crash and subsequent fire fighter fatality occurred during a heavy rainstorm along a 1-mile stretch of a four-lane highway. Thirty-nine collisions have occurred on this 1-mile stretch of road since 1994. Develop, implement, and enforce standard operating procedures (SOPs) regarding emergency operations for roadway incidents. Implement an incident management system to manage all emergency incidents. Establish a unified command for incidents that occur where multiple agencies have jurisdiction. Ensure that a separate incident safety officer (independent of the incident commander) is appointed. Develop pre-incident plans for areas that have a high rate of motor vehicle crashes. Establish pre-incident agreements with law enforcement and other agencies such as the highway department. Ensure that fire fighters are trained in safe procedures for operating in or near moving traffic. Ensure that fire fighters wear suitable high-visibility apparel such as a strong yellow-green or orange reflecting flagger vest when operating at an emergency scene. Ensure that the fire apparatus is positioned to take advantage of topography and weather conditions (uphill and upwind) and to protect fire fighters from traffic. Park or stage unneeded vehicles off the roadway whenever possible. If police have not yet arrived at a scene involving a highway incident or fire, first control the oncoming vehicles before safely turning your attention to the emergency. Position yourself and any victim(s) in a secure area that maximizes your visibility to motorists when it is impossible to protect the incident scene from immediate danger. Figure 1.View of cars that collided with ladder truck. 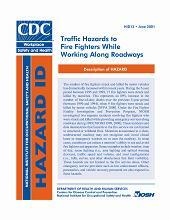 The principal contributors to this publication were Mark F. McFall and Eric R. Schmidt, NIOSH. Internal review was provided by Stephanie Pratt, DSR, NIOSH. External reviews were provided by Rita Fahy, National Fire Protection Association; Barbara Hauser, County Department of Transportation, Phoenix, Arizona; Gary Morris, Phoenix Fire Department, Phoenix, Arizona; Ron Moore, Plano Fire Department, Plano, Texas; Guenther Lerch, Professional Engineer. NFPA . U.S. fire fighters struck by vehicles, 1977?1999. Quincy, MA: National Fire Protection Association. Unpublished. NIOSH . One fire fighter died and a second fire fighter was severely injured after being struck by a motor vehicle on an interstate highway?OK. Cincinnati, OH: U.S. Department of Health and Human Services, Public Health Service, Centers for Disease Control and Prevention, National Institute for Occupational Safety and Health, DHHS (NIOSH) Publication No. 99F?27. NIOSH . Volunteer fire fighter died after being struck by an eighteen-wheel tractor trailer truck?SC. Cincinnati, OH: U.S. Department of Health and Human Services, Public Health Service, Centers for Disease Control and Prevention, National Institute for Occupational Safety and Health, DHHS (NIOSH) Publication No. 99F?38. Dunn V . Safety and survival on the fire ground. Saddle Brook, NJ: Fire Engineering Books and Videos. Hall R, Adams B, eds. . Essentials of fire fighting. 4th ed. Stillwater, OK: Board of Regents, Oklahoma State University. Kipp JD, Loflin ME . Emergency incident risk management: a safety and health perspective. New York: Van Nostrand Reinhold. NFPA . NFPA standard on fire department incident management system. Quincy, MA: National Fire Protection Association, NFPA 1561. NFPA . NFPA standard on fire department occupational safety and health program. Quincy, MA: National Fire Protection Association, NFPA 1500. NFPA . NFPA standard for a fire department service vehicle operations training program. Quincy, MA: National Fire Protection Association, NFPA 1451. NFPA . NFPA standard for road tunnels, bridges, and other limited access highways. Quincy, MA: National Fire Protection Association, NFPA 502. U.S. Department of Transportation, Federal Highway Administration . Standards and guides for traffic controls for street and highway construction, maintenance, utility, and incident management operations. Part VI of the manual on uniform traffic control devices (MUTCD). 3rd rev. Fredericksburg, VA: American Traffic Safety Services Association.